An enormous blimp depicting President Donald Trump as a baby throwing a temper tantrum set sail over the city Friday morning. The blimp went up near the Houses of Parliament around 9 a.m. local time. It’s the culmination of a weeks long online fundraising campaign from a group of British activists. The president arrived in the U.K. on Thursday but is largely circumventing the capital and the massive protests against him. He paid a brief visit to the U.S. ambassador’s central London residence before taking a helicopter to Blenheim Palace ― the monumental house where Winston Churchill was born― for a lavish dinner event with British Prime Minister Theresa May. 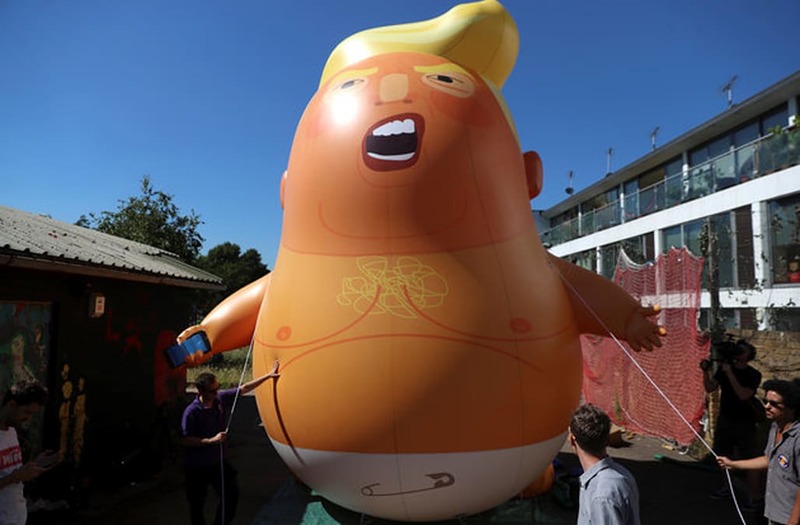 “I guess when they put out blimps to make me feel unwelcome, no reason for me to go to London,” Trump told The Sun in an interview that was published on Thursday where he also sharply criticized May’s Brexit plans. HuffPost UK’s Chris York was on the scene as the blimp was being inflated. 200,000 people are expected to attend Friday’s protests. The less-than-warm welcome shouldn’t come as a shock to Trump, who is extremely unpopular in the U.K. and has had public spats with both May and London Mayor Sadiq Khan. He also sparked ire across the pond last year when he retweeted an infamous British hate group leader. A recent YouGov poll found that 67 percent of Brits disapprove of the president, while a mere 11 percent have positive feelings toward him.